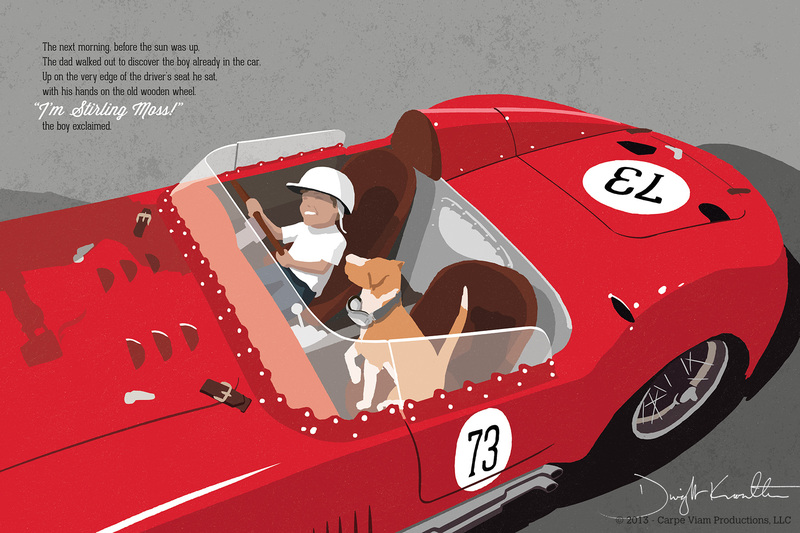 Dwight Knowlton surprised everyone in 2013 with the publication of The Little Red Racing Car, the best car book for kids ever. He funded its production with a Kickstarter campaign, and it’s gone on to win a half-dozen significant awards and it found worldwide distribution with Baker & Taylor. 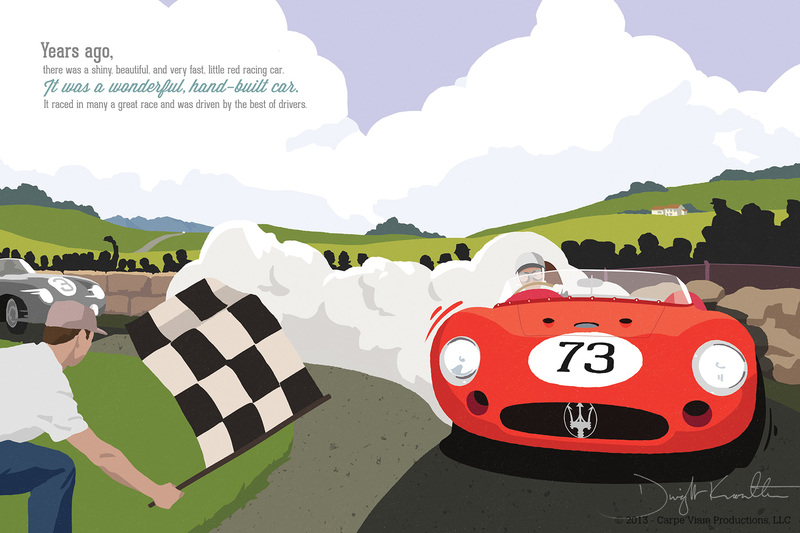 Now, Dwight’s working on a follow-up featuring Stirling Moss, and we got a look at some of the illustrations, plus got to spend some time talking about his time with the world-renowned race car driver. Give me some of your background. Where did you go to school? How did you learn to draw? I started drawing when I could hold a pencil. I wrote my first book at 4. It had cars in it. My mom was kind enough to take my dictation for the text. She was also kind enough not to tell me that it made absolutely no sense! I drew cars constantly growing up. 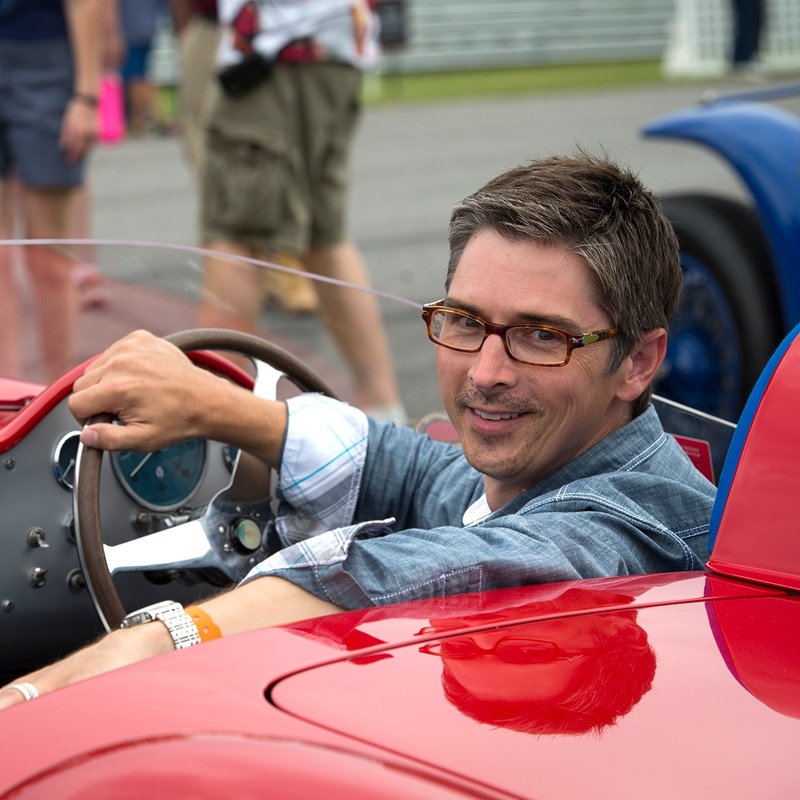 Some were cars I liked, some out of my imagination, some were projects I wanted to build someday – and eventually exploring the possibility of cars that I had. In high school, I entered a giant watercolor painting of a pink street rod in a traditional art competition. I think I got a 3rd in state with it, but they noted in the comments that they didn’t understand my choice of subject matter. In college I majored in Fine Art at first. I was all about drawing, painting and sculpting and swore off the computer stuff, then I took my first design class, fell in love and switched from an Art to Design major. Since college, I have sketched a lot (mostly for design projects in branding or retail environmental design), but I’ve done almost no fine art. So it’s been refreshing (and exhausting) to get my hands back into compositions and technique. I now look forward to spending my second 40 years getting better at this. Where did your love for cars come from? I don’t ever remember not liking cars, but I completely fell in love with cars when my dad read a 1950’s paperback, The Red Car by Don Stanford, to me when I was 8 or 9. I was done for. 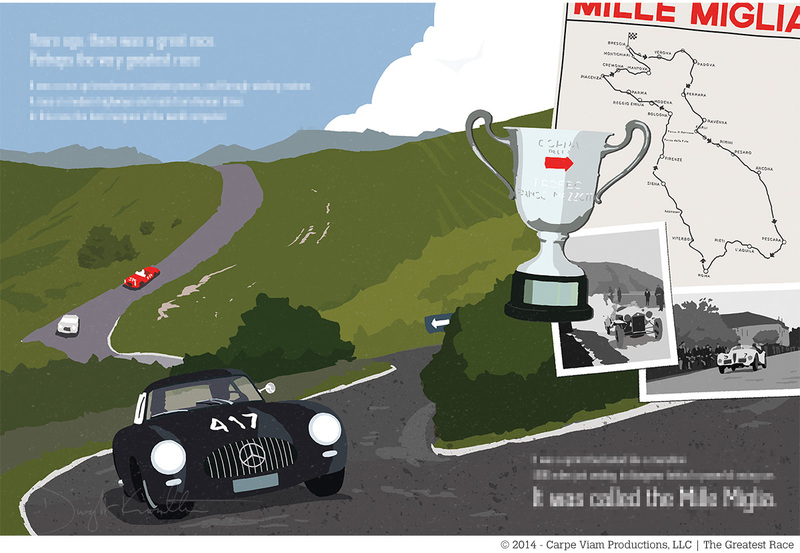 It was the story of an MG TC rebuilt and raced by a teenager. Along the way he meets and becomes friends with an eccentric small town garage owner that turns out to be a former Bugatti racing mechanic. As someone that already drawing cars at every chance, it was over for me. When I was 14, I discovered my grandfather’s retired old farm truck under blankets in his barn. It was a 1965 Chevy C10 that hadn’t been registered (or started) for years. I made him a small cash offer, which he accepted, and I got to work on my first project. At 15, I had some car parts out for sale and a man stopped and started chatting. He assumed that any automotive projects must be my dads, but when I told him otherwise, he invited me to stop by his shop sometime. I did and was surprised to find multiple garage bays full of numerous projects including a ’32 Ford, an XKE Coupe, an early 70’s Corvette and more. He pointed me at the right tools, told me what to do, and over the next couple of years taught me much of what I know today. The first book is really about a father and son, and the car is just — forgive the pun — a vehicle for their relationship. Why did you think it was important to make the story about them, rather than a story about the car’s racing history? I think it has to be a human story to pass the automotive passion down. I think kids need to be able to imagine themselves in the story, and want that story for themselves. I did really care about the car though. That’s a big reason for the book to begin with. There needed to be a kids book about a REAL car. A car that really was driven by a legend. A car that was highly regarded in its time, and is stunningly beautiful still. Tell me about your experience with Kickstarter on the first book. How did it help you put the whole project together. Kickstarter is a tremendous tool. It’s also a LOT of work to create a successful and effective campaign. One of its greatest values I think isn’t just that you can raise funding, but that it also helps to gauge the viability of a project. If you can’t get traction on Kickstarter, you may want to rethink – or at least explore your approach. Give me some information on how well the first book did. You received awards, and sales must’ve been fantastic. For an unknown, first-time, and independently published author, it has done well. I sold out of the first printing in about 6 months. The book is now translated and out in Japan, Taiwan, Hong Kong, and Macau. There are other language deals in the works. The book has been awarded two IAMAs (International Automotive Media Awards). A Gold Medal for Book Design: Total Book, and a Silver Medal for Book Writing: Fiction. It’s also just received an American Graphic Design Award. It’s now distributed internationally by Baker & Taylor so is available to more than 120 countries. I just returned from a weekend signing books at the Limerock Historics in Connecticut, coordinated with the signings of Sir Stirling Moss. It was incredible to meet him and Lady Susie – and to have them supporting this book to which he lent his name. 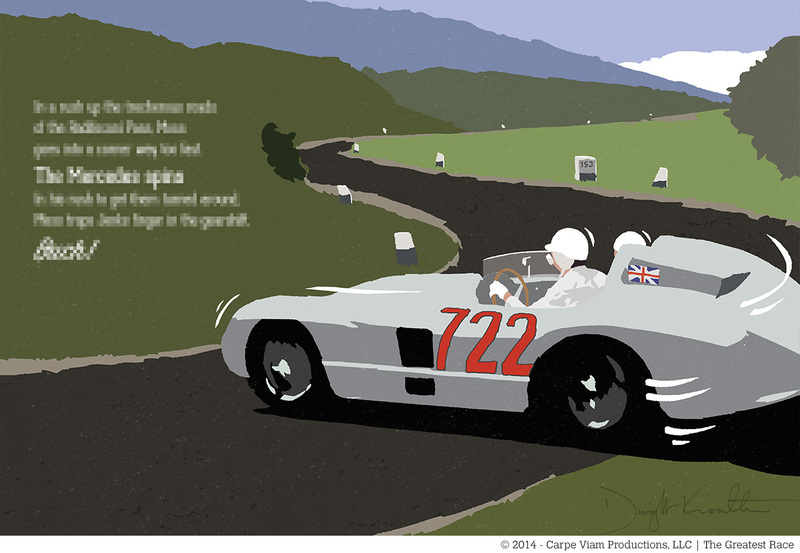 You’ve received some incredible help on the second book in the form of Sir Stirling Moss. Explain how that all came about and tell me what it’s been like to work with him. 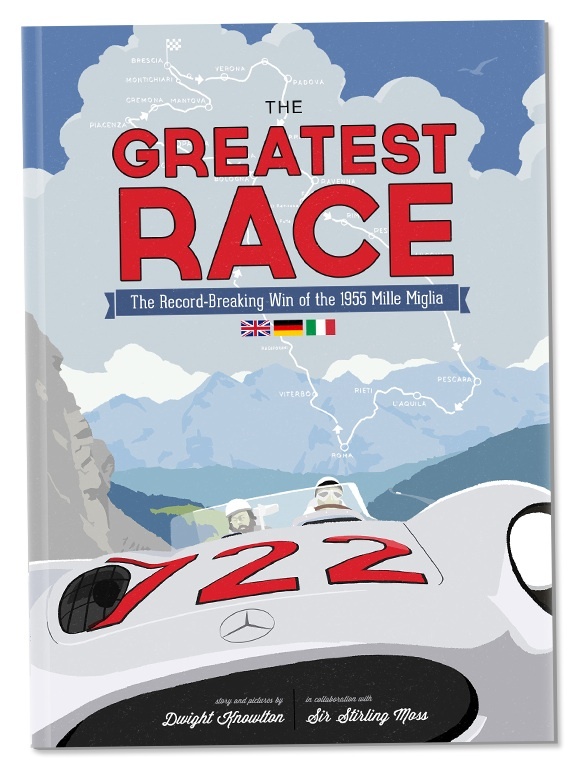 A few months after the release of The Little Red Racing Car, I was walking the Gooding & Company auction in Scottsdale and it just struck me that Sir Stirling’s record win of the Mille Miglia would make an incredible (and exciting) story. It I immediately went home and wrote him with no expectations, and to my surprise, he not only said yes, but has offered incredible support. Not only that, but Mercedes-Benz Classic is on board, and gave me access to incredible documentation from the 1955 Mille Miglia, and the photo archives. Sir Stirling and Lady Susie have been very kind. On our busiest days of correspondence, we had 4 or 5 emails back and forth, and they’ll even close with a “Give the kids a hug for us”, or something like that. How differently are you going to market the second book? I’m guessing you’re publishing this one via a more traditional publishing house, correct? How has that experience been? 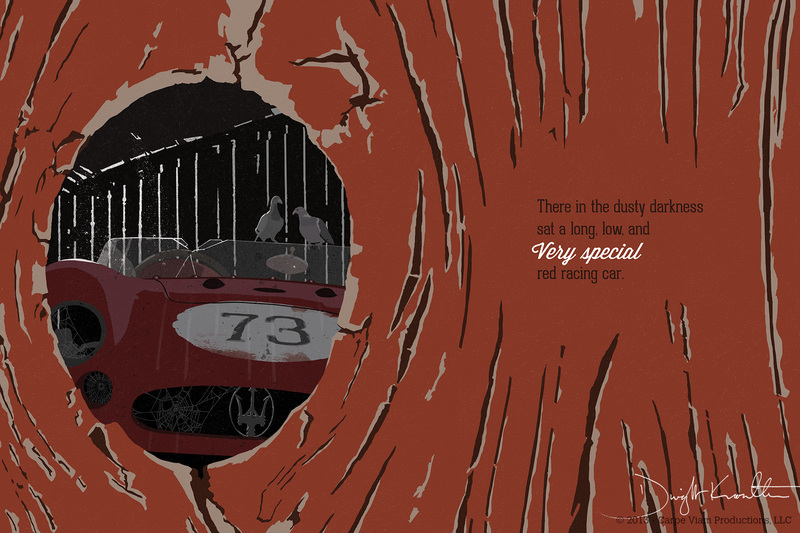 Actually, when I published The Little Red Racing Car, I had a couple publishing offers. When I made the decision to do it on my own, founding my company — Carpe Viam Productions — I made that decision for the long haul. I’ve worked very hard to become a real publisher and get international distribution. That’s not effort (or education) that I want to waste. I also know that there’s no one that will work as hard for my titles as I will, so I really am the best person for the job when it comes to marketing my books. All this to say that The Greatest Race is the second book from Carpe Viam. I plan to keep all of the following automotive books under this banner, though I do have ideas for a couple non-automotive children’s books that I plan to shop with larger publishers. 8. What are your plans for your next book? After The Greatest Race, I’m getting back to The Small Silver Speedster. When Sir Stirling agreed to my plan for The Greatest Race, I delayed The Small Silver Speedster which was planned as Book 2. 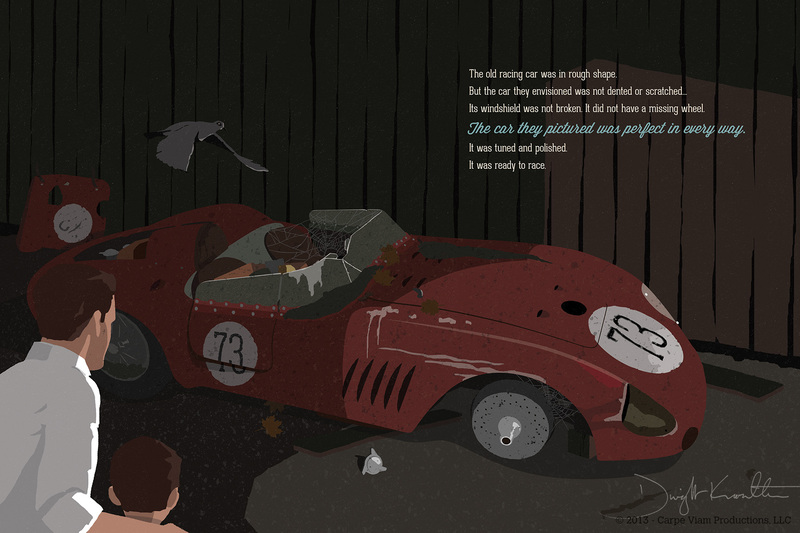 It’s a father/daughter story about a Porsche 356 Speedster. I’ve got the story outlined and am very excited about it. It was challenging coming up with a father/daughter story that I thought that boys could like too, but I think I’ve done it. 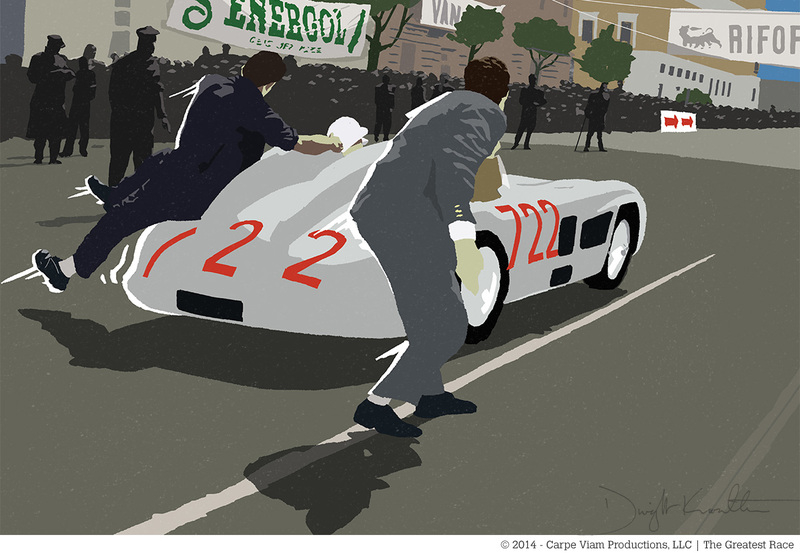 This will make two books about silver cars from Germany in a row, but then I’ll be back to producing one book per country racing color. That’s always been my plan. Britain will be the green Jaguar D-type. France will be a blue Bugatti, I’m thinking a Type 37. And I’m pretty sure that “book USA” is going to be the GT40. As with The Little Red Racing Car, any of these stories that are fiction will be filled with real data, real history and nods to icons. Any plans in the works to do anything animated? I do hope to tell the story as an animated short film in the future. There’s been interest, and discussions with some people that could definitely make it happen. More immediately though, I do have an interactive app in the works for the iPad. It’s been a while now, so I don’t have a projected release date – but I am looking forward to it, and would very much like to do one for each of the following books.